Starting a new job can be exciting. New office, new co-workers, new corner sandwich shop gems to discover. It can also be nerve-racking – new office, new co-workers, no idea where to find a decent BLT. Not to mention the added performance anxiety of that probationary period. Setting out probation periods in employment contracts is becoming an increasingly common practice. Resumes and interviews can only go so far towards sussing out the perfect candidate. A trial period lets an employer get to know their new hire and see if he or she lives up to all that their cover letter promised. It lets the employer assess his or her suitability for their company. There is often a lot of confusion surrounding probationary work periods among new hires. Its length, conditions and your rights – or lack thereof – during this time are a mystery to many. So let’s demystify them, shall we? Let’s start by clarifying what it is, legally speaking. Statutory probation periods are a period of time at the beginning of an individual’s employment when they can be terminated without any notice or pay in lieu thereof. The term is well understood in business and industry as an employee, who is being tested to enable the employer to ascertain the suitability of the employee for its purposes. Probation is a period when the employee may prove that he is suitable for regular employment as a permanent employee and will meet the standards set by the employer. Statutory probation periods vary in length from province to province. They range from just 30 days in Manitoba to six months in New Brunswick. Ontario fits comfortably in the middle with a three-month probationary period. Employers can set out a different probationary length in their new hires’ contract but it may not exceed the statutory provincial length. 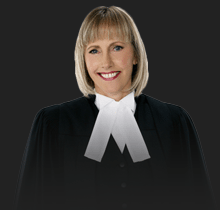 Therefore, it would be fine for an Ontario worker to be on probation for two months but four would be unacceptable and would not be upheld in court. Probationary periods are not automatic. Just because you have started a new job does not necessarily mean that you are on probation. A probationary period must be clearly stated in your employment contract. A contract that states something to the effect of: employee performance will be reviewed after three months will not likely be considered a probationary period if a situation is brought to court. Mention of a probationary period can affect whether or not an employee takes a job, especially if they would be quitting one position for another. 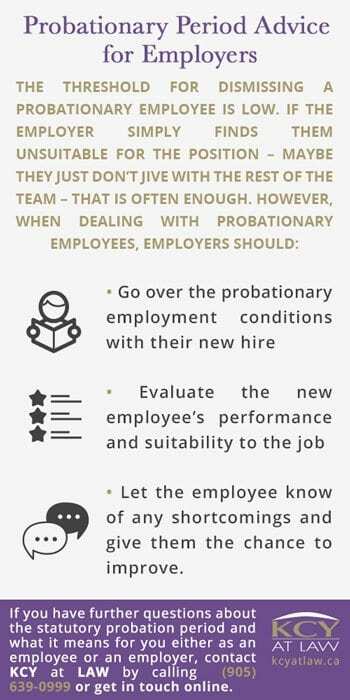 A probationary period means that they could be fired from their new position at their employer’s whim and left without the safety net of termination pay. It is therefore advantageous to all employees if their contract makes no mention of this period. That way, if an employee is fired during the first three months of their employment and their contract did not make mention of a probationary period, they may be entitled to termination notice or pay. Even during the probationary period, new employees are not entirely vulnerable to the whims of their new employer. Wrongful dismissal cases during the probationary period are rare, largely due to the fact that the notice period of such a short period of time would be small, as would the damages. The Employment Standards Act doesn’t set out a notice period for employees of less than three months. However, courts are still entitled to apply common law periods of reasonable notice when they feel it is appropriate. let the employee know of any shortcomings and give them the chance to improve. 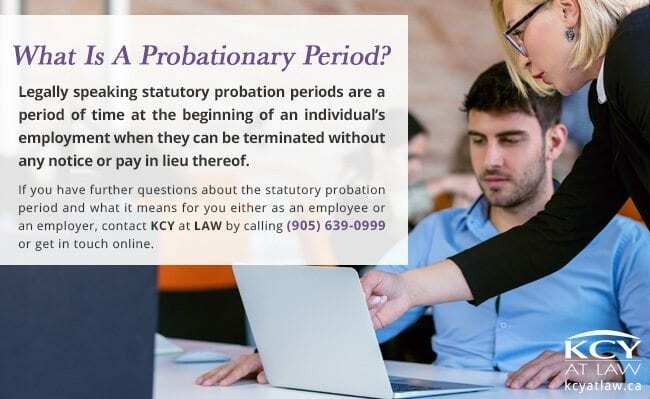 If you have further questions about the statutory probation period and what it means for you either as an employee or an employer, contact KCY at LAW by calling (905) 639-0999 or get in touch online.